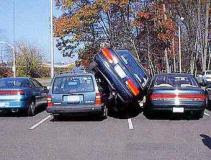 Annoying New England Parkers! Why damn it……somebody please tell me why it is a requirement in New England to slam open your car door when getting out of your car. Especially when you are in a parking lot with tight parking spaces. We have had our Explorer for 6 years and the first 5 years we were in Pennsylvania. We hardly received a scratch during our PA years, and Mrs Iggles worked at a mall for Christ sake (its an expression, I’m Atheist don’t want to offend any Christians out there). So please explain to me why we have two deep scratches and two major dings on the passenger side, one major ding on drivers side, and several small dents all over the truck. All done within the past 14 months. WHY??? Please tell me why. I have a few ideas. The first one is you are so stinkin’ fat that you have to swing the door all the way open just so you can wedge yourself out of the front seat. If this is the case then park a little further away from the entrance so you are not parked next to somebody. You could probably use the exercise anyway. The second idea is that you are an ignorant piece of crap and only care about yourself. In either case, if I catch you doing this I will have no problem flattening your tires, ripping the Mercedes hood ornament off your car, and scratching ‘SCREW YOU’ along the drivers side door. I’ve done it before and have no problem doing it again. George is getting VERY UPSET! Editors Note: If you don't like the fact I make fun of fat, ugly, dumb, foreign, or ignorant people than get over yourself. I'm short, fat, ugly, and bald.....that basically gives me a free pass to make fun of anyone I want. DEAL WITH IT! maybe its your explorer that they hate? Or maybe they read your blog postings? 1. Do i see smiddy in the passenger seat of that car? 2. Mr Iggles you an angry elf, but i love it! !